Despite having fewer students on campus during the spring and summer months, work for the Campus Kitchen Project continues. Nearly 2,000 meals are served monthly to help meet the hunger need in the surrounding community. There are several challenges and opportunities that the program faces during this time. Solutions to these challenges include using pedal power and utilizing donated regionally grown produce. 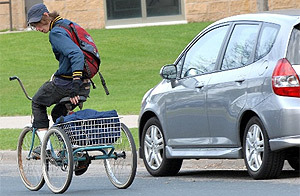 This spring, the program acquired a three-wheeled bike to be used as a delivery vehicle for some of its routes. A volunteer can carry about 40 meals per trip in the bike’s basket. Currently two routes are being done via bike — one route to the Minnesota Indian Women’s Resource Center and the other to homebound seniors. A third is being planned. As far as distance, routes vary from several blocks off campus to more than 10 miles round-trip — a great workout for volunteers that deliver the food. Although it takes more muscle power to get the meals delivered, there are good reasons for using the bike ,says Campus Kitchen Coordinator, Brian Noy. “Besides going green, it also helps to promote healthy living and connects students to the community.” Adding that it’s easier to see and interact with the community when you’re not driving around in a van. It also saves Campus Kitchen the cost of gasoline. Presently, more bike delivery volunteers are needed, and the program is seeking a bike trailer that would allow the use of different bikes. Campus Kitchen uses unused or donated portions of the shares so nothing goes to waste. To learn more about CSAs, go to www.landstewardshipproject.org. Most shares need to be purchased by the beginning of June. Getting enough volunteers can also be a challenge for Campus Kitchen in the spring and summer. With fewer student volunteers, service learners and faculty on campus, Noy relies on the Campus Kitchen intern and other community volunteers. For more information about volunteering, contact Noy at 612-330-1624 or noy@augsburg.edu. For more information, please visit www.augsburg.edu/campuskitchen.